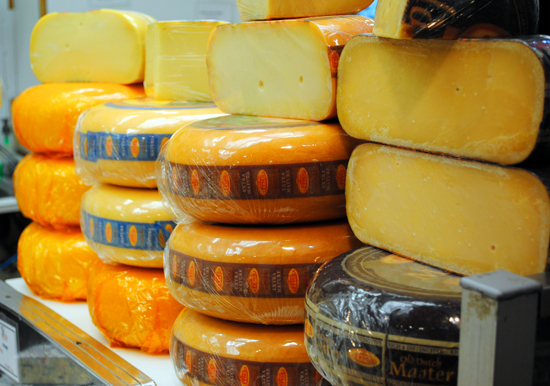 Cheese and I have this love hate relationship. I love it but my hips, not so much. 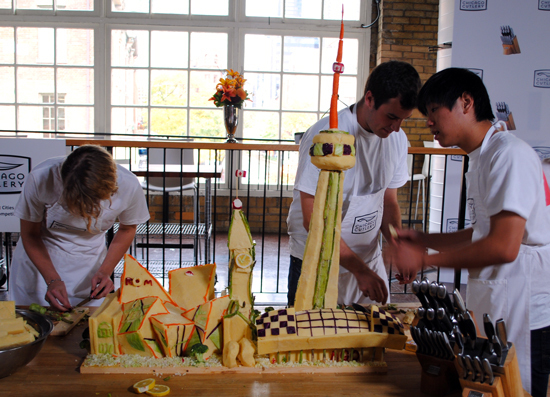 So of course when someone asked me if I want to see a cheese sculpting competition, the answer was yes. 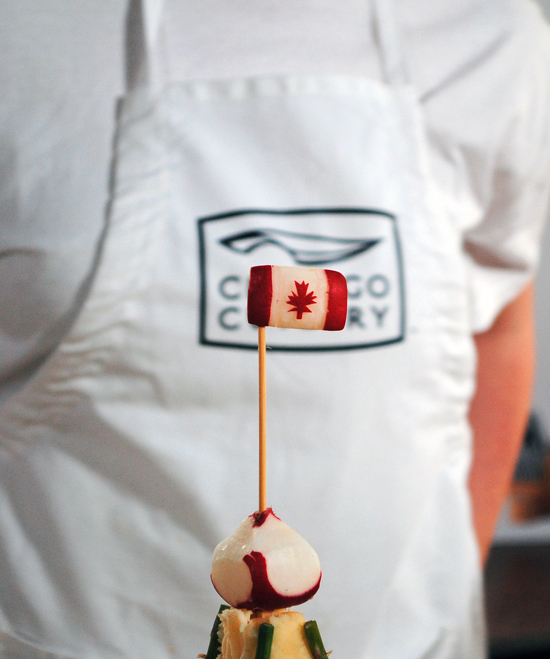 It was slightly a little torturous having to watch other people sculpt cheese, knowing it would probably end up in the trash later on; none-the less the competition was fun to watch. While speaking to some cheese vendors at the St. Lawrence market, I came to find out that these cheese-sculpting competitions are a lot more popular than I once thought. Vendors often find themselves selling ridiculous amounts of cheese (up to 500lbs, as one vendor recalls) to be used for such competitions in the upstairs pavilion of the market on Front St.
On October 14, Chicago Cutlery hosted a cheese sculpting competition, which paired rivals from both sides of the boarder, and challenged them to create the best city scape made primarily from cheese. Team Canada comprised of four young and talented students from OCAD. The American Team had a slight advantage with their team including one culinary student, and three art graduate students. I thought it was a little strange that they choose art students over culinary students; the participants themselves admitted they had limited knife skills, and recalled a few ‘close calls’ while making their masterpiece. 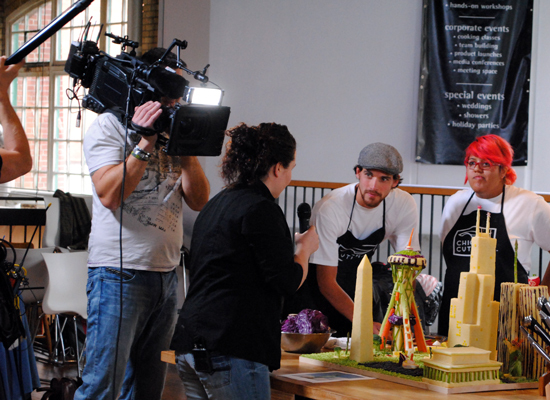 Competitors had a few hours to prepare the city scapes the night before, and limited time in the morning of. The visions were extremely ambitious, and both the Canadian, and American team paid close attention to the details. A panel of distinguished judges closely examined each piece, and ultimately decided in favor of the American team, attributing their success to the ultra-fine detail work and craftsmanship. 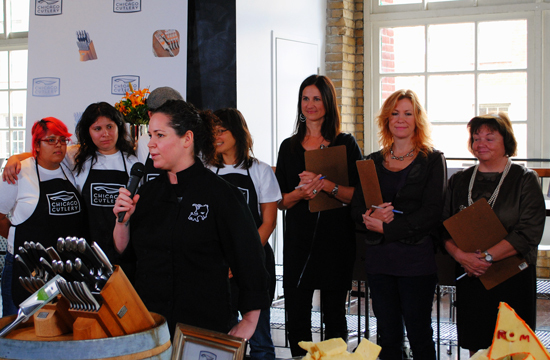 Among the judges was someone you might recognize: Stephanie Izard, Top Chef Season 4 winner. Unless you live in a culinary nutshell, Top Chef is an American reality competition show, where chefs compete against each other in various culinary challenges. Having first hand experience in culinary battles, it was fitting that chef Izard was one of the judges. Yes, watching the competition was interesting, but meeting chef Izard overshadowed any interest I had in cheese sculpting. I anxiously waited for things to wrap up, and with a trembly voice, I mustered the courage to ask Stephanie for an interview. Now let me be clear—I am not a shy person, but for some reason I felt nervous. Why? I have no clue. Anxiety all went away when Stephanie’s down-to-earth charm came through as she agreed to my request. [Madalina] You and I share a few things in common: we have both competed our degrees in Sociology, and chose to head to culinary school in pursuit of a greater happiness. Do you have any regrets about your decision? [Stephanie Izard] NO! not at all. [M] How was that experience for you? [S] I think that by going to university first, and culinary school second, I had a chance to see what other opportunities were out there. By doing so, I had a better understanding that this is what I wanted to do. I’ve never found anything else that I love to do as much as cooking. I don’t know if you feel the same way, but I was always the one crazy person in school that always talked about food: I was always that outcast—until now. [M] I feel the same way; for the first time, I’m on the same page as some of my classmates. I have to ask: What’s life like after Top Chef? [S] Life after Top Chef is crazy. It’s weird—but it’s fun. I own my own restaurant now, but before that, I spent two years travelling the country attending all sorts of events in relation to the show. I’ve met so many different chefs and people in the industry that I wouldn’t of otherwise. It’s not everyday that you get invited to Toronto to judge a competion—stuff like this wouldn’t of happened. [M] What is your favorite dining city? [S] Oh, that’s a really tough question. I would have to say that when I’m on R&D trips, I visit New York. There is however, a little debate about Chicago being the city that is taking over as the destination city for food in the US. With that being said, New York will always have more restaurants because it is such a big city, but I like to think that Chicago is on that list. I’m from Chicago, so I have those bragging rights; but now, more so than ever, we have a whole new generation of chefs that are changing dining in our city. [M] Food is no longer what it used to be, and we have chefs like you to thank for that. [S] I like to think that food has changed—people just want to go out and have fun and eat really good food, without having to think about the white napkin. [M] One last question: If I were to come to visit your restaurant, The Girl and Goat, which menu item is a must-try? [S] It’s funny, because when we planned the menu, we never it would be about the vegetables, but they are becoming everyone’s favorite. We have this green bean in a fish sauce vinaigrette that people are really liking… to the point that people are coming up to us and telling us they are enjoying vegetables for the first time. That would be something you have to try when you come down to Chicago. 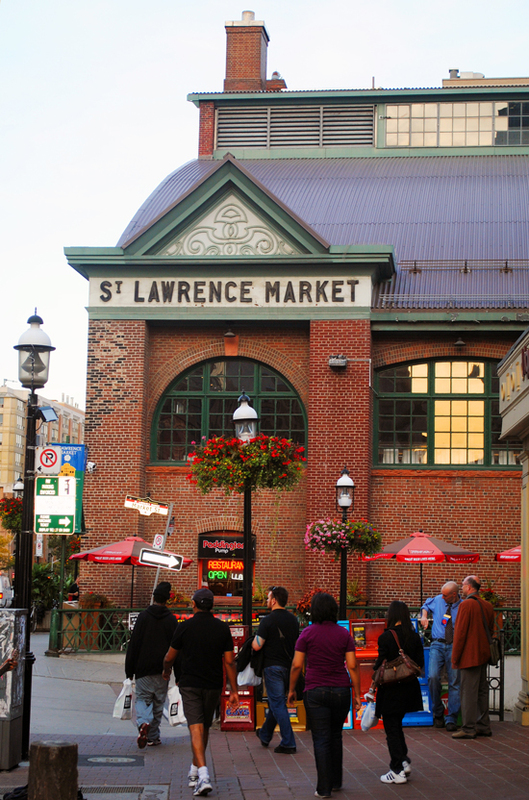 I want to thank Stephanie for taking the time to answer my questions in the ever-so-loud corridor of the St.Lawrence Market. What she said about loving to cook more than anything else really clicked; I too, can’t see myself heading down a different path. If you are in the Chicago area, you have to head down to The Girl and the Goat—their menu sounds absolutely incredible. If you can’t, follow Stephanie on twitter; its not the best substitute, but it’s the next best thing. Click here more information on Chicago Cutlery. 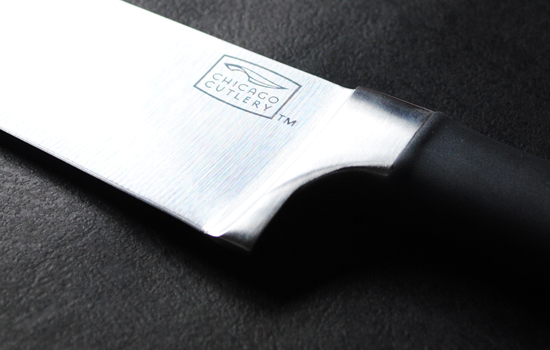 For more information on the Sharpest City competition, click here. Oh how I loved this market when I lived in Toronto 20+ years ago.